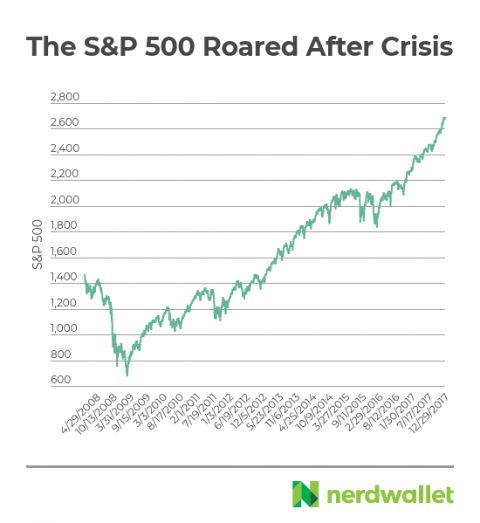 The financial crisis a decade ago was rough for many investors, with the market plummeting nearly 57% from October 2007 to its low in March 2009. Although stocks have performed well since, it’s only a question of time until the next recession comes and investors hit the panic button again. Joining in a market sell-off can cost you in the long run. When panic strikes, great stocks are thrown away at too-cheap prices. Here’s how to panic-proof your portfolio against the next bank crisis or even just a plain recession. Would you buy stocks at the top of the market? That’s exactly what superinvestor Warren Buffett did in 2007, right on the cusp of the bank crisis. In a much-celebrated bet, the investor wagered $1 million that an S&P 500 index fund would beat a hedge fund over the next decade. The bet began right near the top of the stock market, in late 2007. The financial crisis sent many investors into a stock-selling frenzy, but not Buffett, who famously advocates for a “buy-and-hold” investing philosophy. The result? Even at one of the absolute worst times to begin investing, Buffett won his bet by generating a 7.1% average annual return on the wager over the next decade as the market recovered. That topped the hedge fund, as well as savings account rates at banks. Even better, the index fund’s performance should continue to increase over time, closer to its long-term historical performance — 10% average annual returns. By continuing to hold even after the market plunged, an investor thinking long term could have realized nice returns like Buffett did. Investors could have done even better if they bought in while the market was plunging or in the year or two after, when the panic had subsided but stock prices remained below prior levels. It’s gut-wrenching to watch your portfolio decline. The impulse to panic and cash out to avoid more losses is a strong one. One of the easiest ways to resist that impulse is to put your investments on autopilot. Here’s how: Set your brokerage account to buy stock or funds automatically on a fixed schedule. Determine how much you can invest and how often, instruct the brokerage to buy on that schedule, and refrain from adjusting the schedule when you’re emotional or when the market is volatile. When a downturn strikes, automated investing means you’ll continue buying and avoid selling. You’ll also be buying stocks at less than their true value, which will pay off when the market recovers. Another tip: Don’t check your accounts every day. Focusing on stock prices each day leads you away from the long-term mentality that you need. It’s a recipe for bad decision-making. If you don’t already have a plan in place for the next plunge, there’s no time like now to get moving. The time to decide what to do is before, not during, a crisis. If you wait until the crisis to set up your plan, you’ll be tempted to stall until the market is “safe.” But as you can see in the chart above, the best stock prices — and the best returns — come during times of utter panic. Have a plan and be ready to execute it. That means acting while the market is calm. Think long term, put your account on autopilot, and make a plan for the future: These are the best steps for panic-proofing your portfolio.